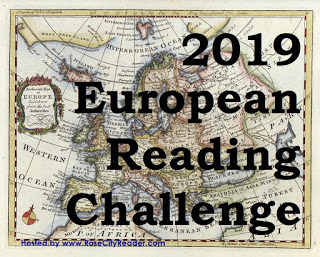 In the 2019 European Reading Challenge hosted by Rose City Reader, participants tour Europe through books. The books can be read (and reviewed) anytime between January 1, 2019 to January 31, 2020. The idea is to read books by European authors or books set in European countries (no matter where the author comes from). The books can be anything – novels, short stories, memoirs, travel guides, cookbooks, biography, poetry, or any other genre. You can participate at different levels, but each book must be by a different author and set in a different country. A book must be reviewed in order to count towards the goal. So far this year I have already read books set in the UK, France, and Greece (no reviews yet). Mrs. Peabody's suggestions for good European translated novel. Have fun, I'm going to miss doing it this year. I am having fun with it, Cath. Soon I will sign up for the World at War Challenge at Becky's Book Reviews. That one will be quite challenging but I figure it can't hurt to try. Tracy, this challenge would have been tailor-made for me, since I have hardly read anything from Europe (not counting the UK). But then, I simply lack the time. How does one learn about translated books? Is there a website or two I can visit? Prashant, I looked and I had a hard time finding a good list. I started with translated fiction, then looked for translated crime fiction, then narrowed it down to "translated European crime fiction". I have added a couple of links in my post that could be useful and if I find more I will add those also. It is hard to find the time to read all the books we want to. I sympathize. Thanks, Tracy. Just today I came across a list of top 10 or something of Nordic noir novels and shared it on Twitter. That way I can look it up whenever I want. That sounds good, Prashant. There are lots of good resources. That's a great challenge, Tracy, and a good way to widen the reading horizons. I'll be interested in the books you choose as you go along. Thanks, Margot. Sometimes it is hard to choose a book. I have so many possibilities for Germany, and I am sure I will end up reading several of those. I do want to add countries that I did not read about last year, Rick, but I am not going to push myself too hard. I just want to have fun. I've signed up for this one but not yet read anything towards it, apart from the UK which is an easy win for me. Good luck with your participation. I always read a lot from the UK, too, Col. This time I am aiming to review and link one for Scotland (assuming I review it). I have done that one plus two other countries so far. Thanks for signing up again! And thanks for the list of translated books. You almost won in 2018. I'm about to post the winner. You got honorable mention for visiting 14 countries. I do hope to increase the countries I visit this year, Gilion. But seriously, I don't do it for the prize, but for the fun of it. It is a great challenge.